Every year, my work does the company picnic at Elitch Gardens in Denver, Colorado. Since Tristan has been born, it is a different experience going there. This year's visit was quite an experience - especially since he is two-years old. 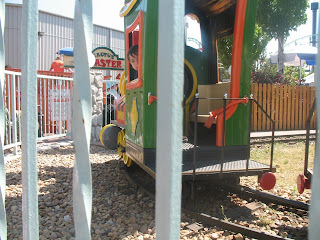 After sending the guys to go do rides, Grandma and I took Tristan to the kiddie area of the park. 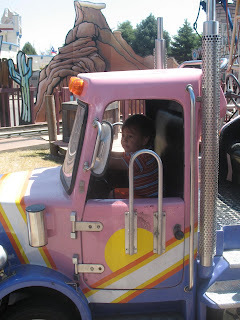 This year would be different from last year since he can go on some of the rides by himself. So, we find this ride, big rig trucks that go around a track twice. We strap him in and his apprehension kicks in. By the second time around, he was crying. However, when I went to get him out, he was screaming - he didn't want to leave. Trying to convince him that it was the other children's turn, I dragged him out screaming. We then resolved to going to the ball pit and letting him get some energy out. After the ball pit, we tried two more rides, but both in miserable failure. He was too picky with the color of the balloon ride he was being put in, so Grandma took him away from that. Figuring that a train ride would do, he doesn't like the one that parents and kids can sit in together - he wanted the front of the train (which was already full). So, we drag him out - kicking and screaming. We put him in his wagon, hand him "Mr. Bear", and head for the picnic pavilions. I wasn't going to deal with it any longer. After lunch, we spent a few hours at the water park. Tristan absolutely loved the wave pool. He wore us out. Once we dried off, we tried one more time with rides. After each one, though, it was like pulling teeth to take him away without screaming. 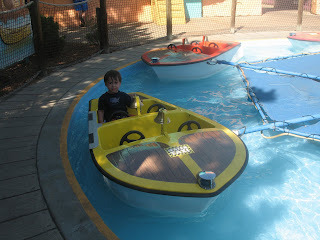 But below are a few pictures of the rest of the rides. 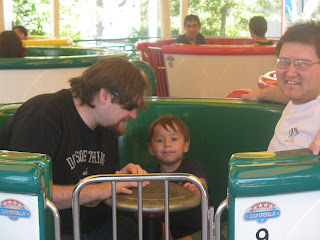 Daddy, Tristan, and Brad (friend) on the teacups. Don't worry, they didn't spin it fast. They did a trip without Tristan to do the fast spinning. Tristan on the "choo-choo train"
It was hard to get a good picture with him inside the thing. 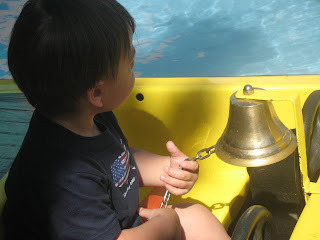 Tristan on the boat ride, ringing the bell. Tristan on the boat ride. While he doesn't look happy, he actually enjoyed himself. Only issue with this ride - the attendant, once the ride stopped, just unbuckled him and walked away. Tristan nearly took a dive off the back of the boat - he even got his shoe wet. We didn't even get an apology from him nor the supervisor (she just made excuses that he was an international). We were pretty livid because of that. After all the excitement, we decided to leave for home. Tristan already had that in mind - he fell asleep in his wagon. He didn't even wake when we put him in the car. I got this picture of him when we stopped for some grub (not thinking of doing any cooking after a long day at the park). 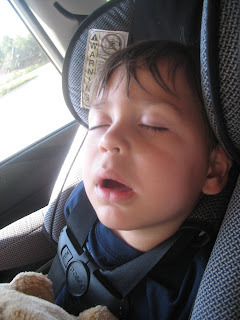 Although, he was tired, he managed to wake up for a burger, fries, and apple juice (he nearly ate the whole meal!). Hopefully, we can make it to Renaissance Festival this summer. We'd also like to take Tristan to the Denver Aquarium, Children's Museum, and the zoo. He absolutely would love to visit all three. We'll see how we're doing on funds and spread out the visits this summer before the baby arrives. Well, I'm tired from today's long day. Tristan and the heat wore me out.